Neo4j on IBM POWER offers large extended memory, drastically increasing the size at which real-time graph queries are possible. 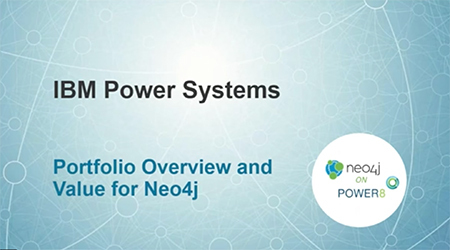 Real-time graph processing with Neo4j on IBM POWER supports both standard operational requirements and analytic insights that normally require offline processing. IBM POWER hardware allows Neo4j to scale both up and out for graphs of greater size than ever before. The combination of Neo4j’s native graph processing and storage and IBM POWER’s in-memory vertical scalability is a natural convergence. Neo4j on IBM POWER makes it possible to store and process massive-scale graphs in real time – a problem that was simply unsolvable only yesterday. Together, the strength and performance of Neo4j plus the scalability and speed of IBM POWER will provide unrivaled graph application performance. IBM Power Systems are specifically designed to capture and manage data from a variety of sources and put that data to work in your enterprise – including real-time graph processing. The IBM POWER8 provides up to 56 terabytes of extended memory space with CAPI (Coherent Accelerator Processor Interface) flash architecture, accommodating graphs of huge size and scale. IBM Power Systems built on POWER processors are optimized for a broad range of data workloads, including graph data. IBM Power Systems deliver cost-effective, high-performing and agile IT infrastructure so enterprises can leverage the most advantage from their diverse data sources. Neo4j® on IBM POWER® is the result of a joint effort between Neo4j and IBM engineering to provide the world’s most scalable graph database platform capable of storing and processing graphs of extremely large size all in-memory – shattering all previous real-time scalability limits. IBM and POWER are registered trademarks, and other company, product, or service names may be trademarks or service marks of International Business Machines Corporation in the United States, other countries, or both.